Shareen Begum couldn’t be having a heart attack, could she? She wasn’t short of breath. Her chest didn’t feel tight. But on the morning of October 4, 2016, the 52-year-old from Fiji didn’t feel normal. Her jaw was burning and her shoulder was in pain. Nevertheless, she didn’t want to wake up the family. A housewife of 28 years, she wasn’t in the habit of going to the doctor or asking for help about her health. Finally, concerned about the ongoing pain, Shareen woke her husband Mohammad Khaliq. Soon, they found themselves in an emergency room, where a doctor told her she had just had a mild heart attack because of blocked arteries and was desperately in need of CABG, otherwise known as bypass surgery. The couple was in complete shock considering that Shareen had never been prone to falling ill, and the suddenness of the news which was rather unexpected. “I always felt that there was something wrong, but hearing that all my arteries were blocked was a huge surprise”. After preliminary tests were conducted, the next plan of action for the couple was to find adequate treatment and surgery. Although surgeries of this nature were once considered risky, thanks to advancements in the field of cardiology, surgical procedures today are far more refined – and the rehab that follows even more. Coronary artery bypass graft surgery — or CABG, pronounced “cabbage” — is one of the best known, most studied and most effective surgeries of the modern age. “It’s a very safe operation", says Dr. Manish Bansal, Associate Director - Medanta Hospital. 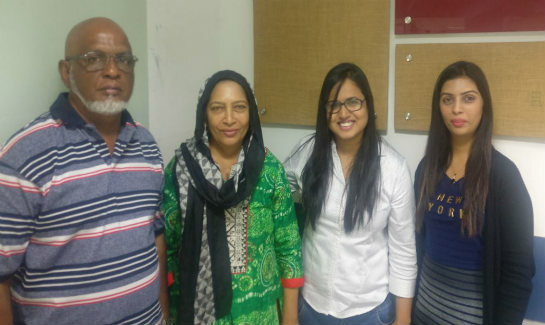 After carefully weighing their options, the couple decided to seek help from Vaidam Health. 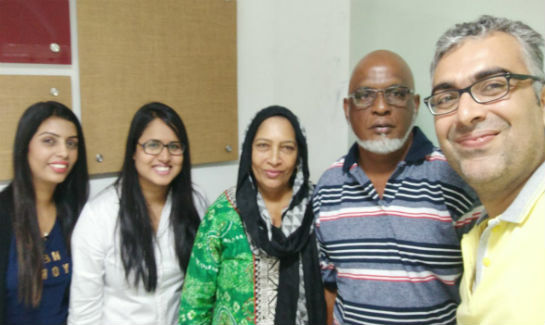 The decision of going with top cardiology hospitals in India came after a close friend from Fiji had been through a similar situation and was all praise about their recent medical trip to India. “Hearing about Vaidam, we wanted to see for ourselves if the overall experience was really true”. The couple was pleasantly surprised with what they witnessed just on the very next day; they had received an email from a Health Rep from Vaidam with details of procedural information with possible treatments; more importantly, they have assured a promise to “take care of everything”. Little did the couple know, over the next month they were going to be in perfectly capable hands. Arriving in New Delhi, on 20 February, Shareen and Mohammad were taken directly to Medanta hospital. After the preliminary test was conducted to check Shareen’s heart condition, doctors advised to go with surgery as soon as possible. Dr. Manish Bansal who was going to be Shareen’s surgeon had over the years seen multiple cases of blockage and had performed numerous surgeries. The idea was to get the surgery over as quickly and efficiently as possible, so that patient could move forward with rehabilitation. “Dr. Bansal is one of the top 10 best cardiologists in India. He assured us that everything was going to be just fine and that we had nothing to be worried about”, said Mohammad. 7 days after the couple entered the hospital, the doctors discharged Shareen after a successful bypass surgery and positive recovery signs. Over the next few days and weeks Shareen would require close monitoring of her heart and adequate rehabilitation. In order to supplement their next few days in India, their case manager went ahead and made comfortable living arrangements for the couple; ensuring that it was somewhere near the hospital in case they needed something quick during a emergency. Shareen found adequate rehabilitation and was quickly seeing signs of improvement. After being in India for over 1 month, the couple made their way back to their home-town in Fiji. Now back in Fiji, the couple look at their experience in India and are grateful with the way things turned out. “Our friend was truly correct in advising us to approach Vaidam to help us out of this severe situation. How else could we have done this, but without your help, asks Shareen. A cheerful Mohammed asserts, “You have a true friend here in Fiji, we are forever grateful”. We look back at the lives of Mohammed and Shareen and are filled joy that they found the right treatment at the right time. Happy knowing that they could trust us with their lives and we were more than happy to oblige.